Brothers on Bikes was founded in 2015 by 23 year old Londoner Junaid Ibrahim, who works for sports and education charity Off The Street. Its founding aim is to encourage and support young Muslim boys and men to get cycling. The project provides focused support for boys from Indian, Bangladeshi and Pakistani backgrounds – young people who face many barriers to getting on the road. Whether it’s a lack of confidence and equipment, or a lack of awareness of local parks, green spaces and safe routes –plenty of factors make it hard to get started. Some are held back by the stigma of owning a bicycle instead of a car, or visions of riding round alone in the rain. By building a vibrant cycling community, Brothers on Bikes is working for all that to change. ‘Junaid had participated in the mayor’s Skyride events and thought: “Wouldn’t it be amazing if I could do this for my local community?”’ – Guardian, 2016. 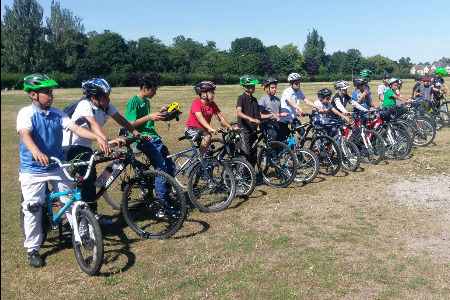 Based in Redbridge, the project now provides 5-16 year olds with training rides, confidence and skills advice - alongside safety and repair workshops to keep things running smoothly. A City & Guilds cycle maintenance course is a key part of the course. The CGL grant has paid for new equipment, improved workshops and regular sessions. Regular rides and training are held in local parks, mosques and community centres, and aim to get the boys out and finding their way around their local area. Participants would like to see the club expand to provide longer rides, and even racing advice. And it looks like they won’t have to wait long – the club has been widely popular, and on Friday 20th May, Brothers on Bikes scooped the Community Project of the Year Award for their work to date. To find out more about Brothers on Bikes, please visit their website at http://brothersonbikes.cc/ or follow them on Twitter.